Hello! Susie here today with a Christmas themed layout featuring papers from several Quick Quotes collections! I mixed together some reds and teals to scrap this photo of my daughter and her visit with Santa! The background is from the Alton Collection. The red layer is from Cracklin' Rose. The blue and white layer with the decorative edge is actually from the June Club Q Page Layouts which featured papers from Baggage Claim. The strip is from Sheer Joy. The wooden Christmas tree is from my stash! The word strip across the bottom is also from the same sheet of Sheer Joy. I added a chipboard word, rhinestone flourish and a snowflake button from my stash. 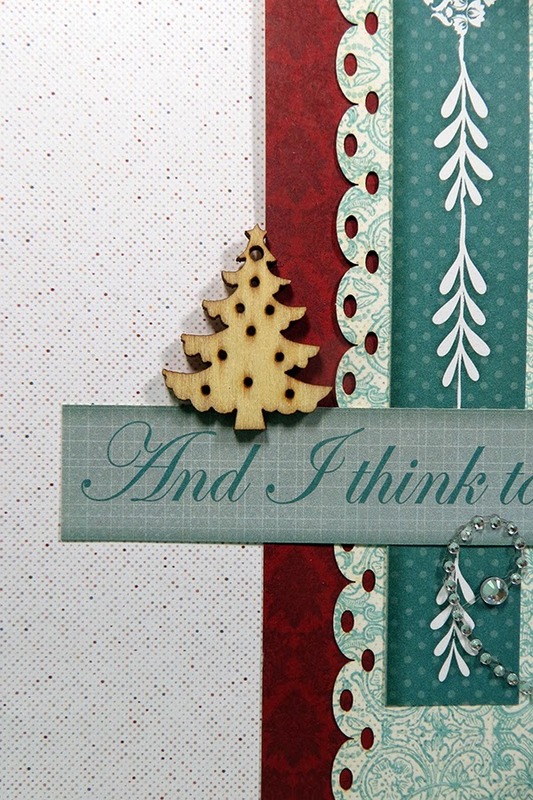 This sentiment card is from the Quick Quotes Holiday Bundle. In the upper right I added another rhinestone flourish, a flower and more wood veneers. There is also a lace doily die cut peeking out from behind the photo.